A Guide to the 37 Most Weird Foods... Waiting To Surprise You In Thailand From Ant Eggs...To Water Bugs Every visitor to Thailand is interested in the country’s ubiquitous bug carts. Those cute two wheel trolleys pushed along the night streets by smiling vendors selling – well, selling bugs. Their usual menu runs the gamut from grasshoppers to scorpions. But bugs as a gourmet treat are only the most obvious of the many food challenges awaiting unwary visitors. Other surprising ingredients range from dancing shrimp to rats. Even apparently harmless dishes, like a soup, a salad or a glass of water, can be dangerous for the unsuspecting. 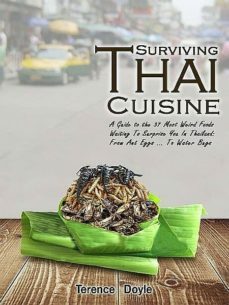 Surviving Thai Cuisine will guide you past most of the main culinary minefields. At the same time, it also offers an introduction to Thai food generally and to many other aspects of Thai culture.